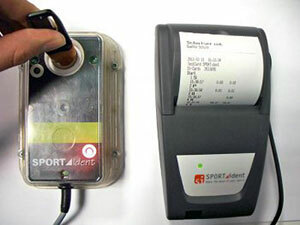 Details of the SPORTident electronic timing kit we own and how to use it. Start: When the participant punches at the “Start” station the competition-time starts. 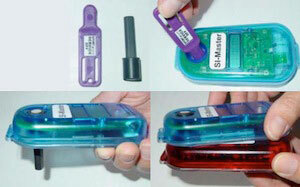 If the SI card is not cleared correctly, no start signal will be emitted. 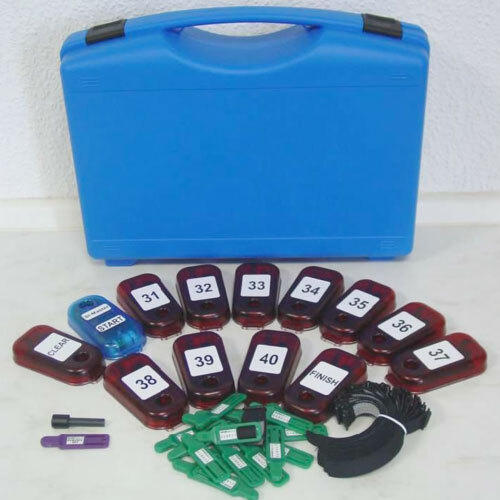 Control stations: When the participant punches at the control station the control number and the time are stored on the SI card (the control numbers can be in any order). Finish: When the participant punches the finish, their competition time ends. If they are unused for 30 minutes, SPORTident stations fall back into standby mode automatically. Connect the printer to the BS7-Print station using the black and grey cables. Use the purple card marked “Clear backup” to erase the memory of previous events BEFORE each event. Insert the competitor's SI card and wait till it beeps, it will print the split times for that card. After all runners' splits have been printed insert the purple “Print results” card till it beeps, it will now print the results in order per course (it will automatically match all competitors with the same punched control sequence). The printer has a rechargeable battery, so remember to charge it up prior to each use. It can take several hours, so leave it plugged in overnight. The stations' internal clocks need to be synchronised before every important event or every month (whichever comes sooner) using the blue SI Master station (this also doubles as the “Clear” station). Insert the purple card marked “Service/Off” into the blue SI Master station, the display will cycle through its 3 modes of use. The third one “EXT MA” is the one you want, remove the card when it appears. Place the SI Master station on top of a control station, after a few seconds it will beep twice, the time has been synchronised. A "start" punch in the Printout station initiates a common start time (mass start) for all SI Cards that are read in afterwards. However if there is a start punch in the SI Card too, this punch will override the mass start and will be used for time computation instead. After the event the mass start time must be cleared with the instruction card "Clear backup".